Please note that we are now creating our blogs on our new website, you can follow us, read, hear, watch and look at our projects at arthur-martha.com/ An archive of blogs will remain on this site. Our days spent at The Booth Centre for the project Moving Panorama typically fall into a pattern, in the morning Matt and I work in the main one-to-one with people, it might be editing songs or gathering new material in the form of life story work, or themed interviews. Sometimes it’s simply chatting, listening, having a conversation- this activity could be easily undervalued, but it’s having time to be still and listen, that helps to build trust, builds a relationship and motivates new people to join our afternoon group sessions. At times there are things that are very difficult to hear, cruelties re-told, re-examined, re-lived. Many if not most of the people we work with have suffered trauma of one description or another. The Booth Centre works to support people through their issues and to find ways to look and move forward. The art and music we create during the project Moving Panorama subtly supports this process. We see people’s confidence and skills improving, abstaining from drink or drugs, surprising themselves about their capabilities, finding joy in abilities they didn’t know they had. This project is also supporting and challenging my own work as an artist. The quality of the collaborative song-writing that Matt is leading, and the art work that our group is producing, is keeping me on my toes, re-freshing and challenging my art practice, keeping it fresh, motivating me. Yesterday afternoon we brought colour into the project- literally- until now all of our scrolls have been in black and white. Rolled out on the long table was 10 meters of white paper. We took out paint brushes for a walk, between readings of the first draft lyrics to one of the new song ‘Always Forward‘. It’s a song that thinks about all the people who have walked the streets of Manchester before us, and those walking them (or sleeping on them) right now. 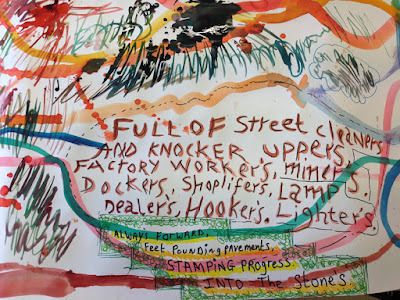 We all walked around the paper, filling it up quickly with vivid colours, crossing one anothers paths. The physicality of creating art, the speed and looseness, made us quickly warm up and relax into art making. We became quiet and focussed, enjoying the nature of the art materials as colours bleed into one another, the delight and magic of the process of painting. Into these painted pathways, we started drawing, writing and painting in response to the lyrics of the song. The scroll quickly took on a depth of meaning, a curiosity, a maturity. The resulting artwork will look different again once they are moving across the Moving Panorama frame, at which point it maybe edited, drawn into again. The scroll artworks we are created stand alone as individual pieces, but I am confident that when they are performed with the songs, both artistic disciplines will enhance and bring alive each other. We will get to try this out very soon…. Artist Lois Blackburn writing about the project Moving Panorama, a collaboration between The Booth Centre, Matt Hill/The Quiet Loner, Lois Blackburn, and The People’s History Museum. Supported by Arts Council England.